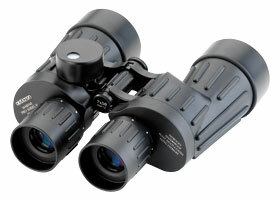 Marine series binoculars exemplify our commitment to provide quality, innovation and choice. Whichever model you choose, each instrument has been specifically designed and manufactured to meet the toughest performance criteria demanded by the enthusiast and professional user. All five models have 7x50 specification, enlarged porro prisms and anti-reflective coatings to maximise overall viewing performance. The inclusion of long eye relief eyepieces and the large depth of field attained by all models provide the best chances for stable viewing under constant motion with or without spectacles. Opticron Marine binoculars are fully nitrogen gas filled waterproof to render them splash proof as well as helping to eliminate problems of condensation in often harsh environmental conditions. Protection from the inevitable knocks and bumps associated with sometimes severe use are derived from brace mounted prism assemblies combined with thick and highly durable rubber armouring. Pro Series II BIF.GA / C compass is designed for use in the northern hemisphere (Region 1). Compasses for other world.